One of the most popular chipsets in last year's midrange, you can easily call the Snapdragon 615 ubiquitous. We have about 70 devices powered by it in our database, and the Lenovo Vibe K5 Plus uses a slightly updated version of that SoC, which Qualcomm calls Snapdragon 616. The difference is so subtle that popular apps like CPU-Z report it simply as Snaprdragon 615. Anyway, here half of the 8 Cortex-A53 processor cores can reach up to 1.5GHz (so slightly lower than Qualcomm's nominal 1.7GHz), while the other 4 are capped lower, at 1.21GHz. The GPU is the familiar Adreno 405, and operating memory is 2GB. The setup is so common for a reason and the reason is that it provides adequate overall performance over daily use. Starting with raw CPU performance, we ran the K5 Plus through Geekbench, where it scored nearly identical results to the Oppo F1, itself powered by the S616. Popular S615 devices like the Motorola Moto X Play and Sony Xperia M4 Aqua are trailing behind, but they were never among the best ambassadors for the chip, at least as far as benchmarks are concerned. More importantly the Vibe K5 Plus bested one chief competitor in the face of the Xiaomi Redmi 3. Basemark OS II 2.0 is an established compound benchmark, which can give you an idea of the overall performance you can expect from the Vibe K5 Plus. With a score in the high 800s, the smartphone is somewhat behind the Oppo F1, but it's equally ahead of the Redmi 3, so another win against its archrival. The major names like the Moto X Play and Xperia M4 aqua are left behind too. The Redmi 3 suffers another loss in the older version of Basemark OS II, where the K5 Plus' lead is even more pronounced. Then again, the F1 is further ahead of Lenovo's entry, too. The Xperia M4 Aqua does redeem itself a bit, but not so for the Moto X Play. Antutu's become another industry standard benchmark, even if its numbers are too often used for bragging rights. We haven't yet had the opportunity to build an extensive database of scores from the latest benchmark version, especially when non-flagships are concerned, but we do have a few affordable entries to compare the Vibe K5 Plus with. 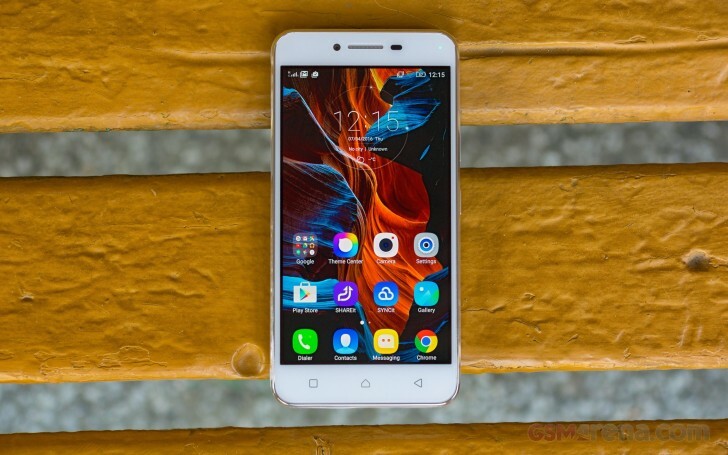 The good thing that can be said is that the Lenovo smartphone posts a virtually identical number to the Oppo F1, which is markedly more expensive. The Xiaomi Redmi Note 3's are flying high here, especially the Snapdragon 650 version. Antutu 5 is where we've got a larger selection of smartphones, and a wider base for comparison. Similar figures as the Redmi 3 here, both ahead of the Xperia M4 Aqua, but still not on par with the Moto X Play. Graphics performance is where the Snapdragon 61x typically struggles with 1080p displays. The Vibe K5 Plus is no different in this respect, only managing 5.5fps on GFXBench Manhattan. Onscreen or off, the Vibe K5 Plus put out the same frame rate, its display being 1080p, which is the standardized resolution for the off screen test. Most others fare better when rendering in their native resolution - one of the few advantages of 720p displays. Both the F1 and the Redmi 3 fall in this category, and so does the M4 Aqua, and all three manage more than twice higher frame rates. That said, even the Moto X Play with its FullHD display scores about 10% higher than the K5 Plus. In Basemark X the K5 Plus loses to the Xiaomi Redmi 3, if only 5% behind. All of the usual suspects have overtaken the Lenovo, though, the Oppo F1 by the longest margin.